In Pittsburgh, I live near the Squirrel Hill Tunnels which is one of the main points of getting in and out of the city. Well, it’s under some construction work which forces the traffic down closer to my home one way street. Plus the hammering and beeping of trucks even during the early mornings force me to think of ways not to scream at the workers or drivers blowing their horns when the traffic is stalled like it’s going to move them out of the way. My little kitchen to the rescue of my sanity and voice not to mention all those who are disturbing my beauty rest. I checked with my fellow foodies, friends and family about the combination for my dish experimentation. 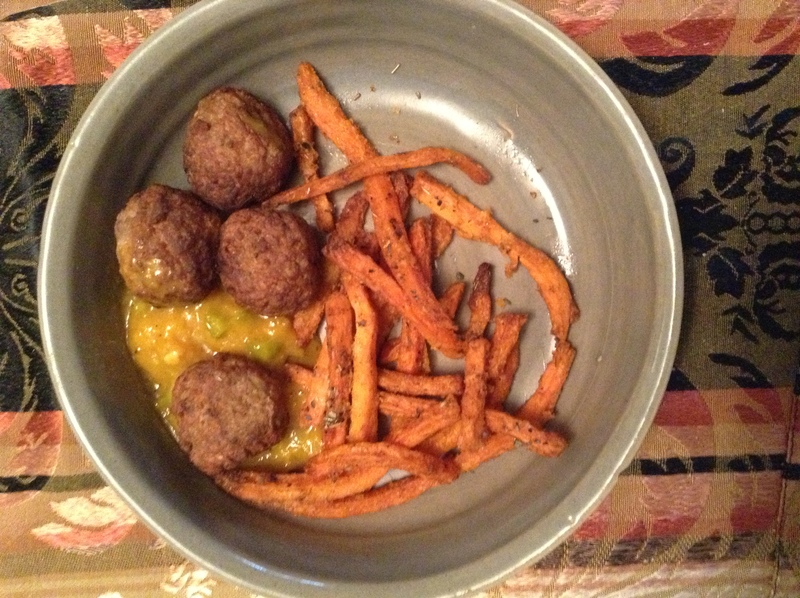 One of the dish is my turkey meatball with mango relish and spicy sweet potato fries. The other is Onion steak covered in tomato sauce with garlic spinach and popcorn brown rice with black eye peas and black beans. Now, I’ve made all the different dishes before but this is the first time I’ve put them together. I’m always concerned about one flavor overriding another instead of working together to make perfect harmony on the taste buds. Turkey meat always need a bit of oomph, to me anyway, with some seasoning and a bit of olive oil in the mixture before placing into the oven covered to start to keep in moisture then uncovered for a bit of browning. Sometimes, I’ll start it on the stove top to get the browning and then place into the oven covered until completely cooked to keep that juicy flavor. Depending on the dish. I will sometimes place it in my desired cooking sauce but since I was putting it on my mango relish I didn’t place any sauce on the balls or on the plate. The spicy sweet potato fries are one of my favorites to make but are also a bit time consuming. I work on getting the sweet potato cut into strings but next time I will work on cutting it into steak size bites instead. After taking off the skin and cutting into desired size and shape, I place the sweet potatoes into a shallow pan, drizzle olive oil over, toss on cajan pepper, salt, pepper, oregano and a bit of parsley. Pop the pan into the oven for at least 45 minutes at 425-degrees. Depending on the texture you desire, you can leave it in the oven a bit longer but I like mine since I cut them small to have a bit of that soft tenderness when biting into it. Here’s the before and after photos. 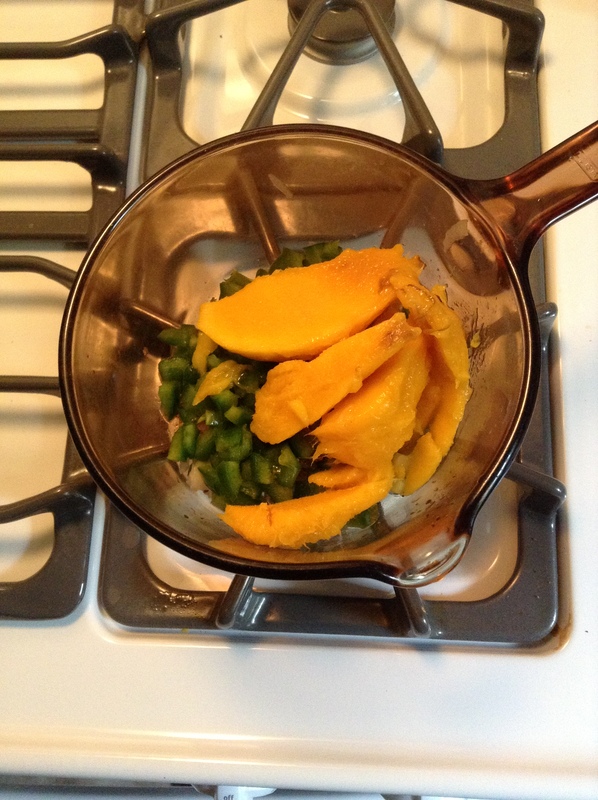 My mango relish consist of fresh mango, onion, green pepper, salt, pepper, olive oil and parsley. 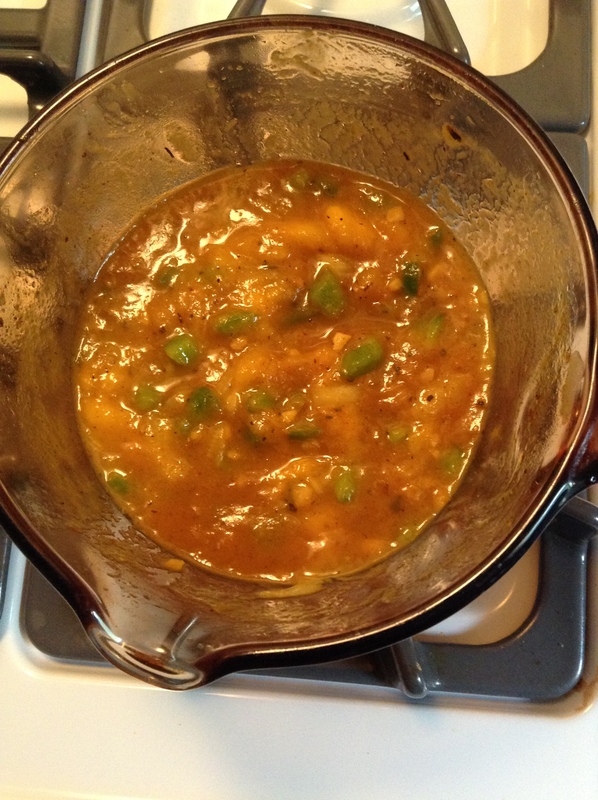 I combine all the igrendents in a sauce pan over low heat, continual stirring so the mango is broken down but still allow for some pieces to burst with juices in the mouth. 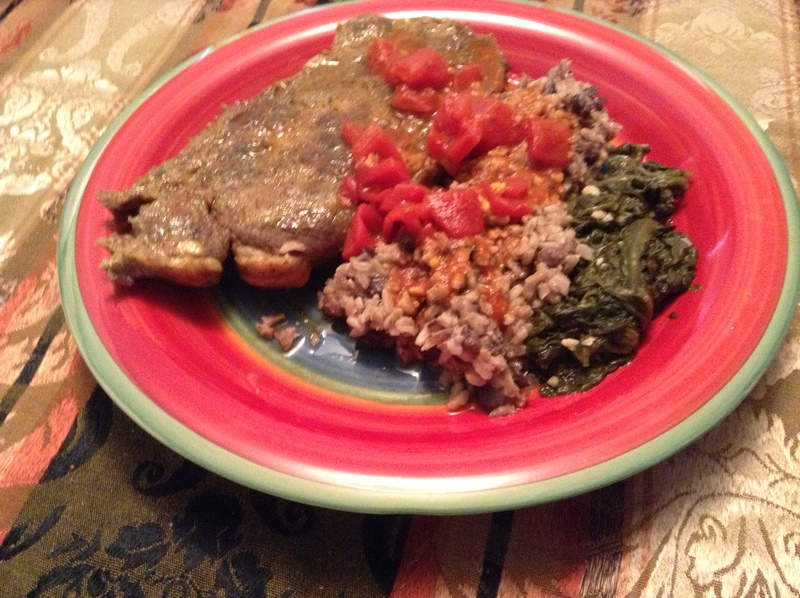 The second dish – Onion Steak with tomato sauce, garlic spinach and popcorn brown rice with black eyed peas and black beans remind me of things my daddy likes to eat. I seasoned the steak with paprika, salt, paprika, cumin, and dried parsley. Then I place the sliced onions onto top of the steaks then into the oven coverered to start then uncovered for five minutes. Topping the steak is the tomato sauce which consists of quartered fresh tomatoes, salt, pepper, dried parsley and olive oil. All combine in a sauce pan on top of low heat. The garlic spinach is the easiest to make with just fresh spinach, garlic, salt and pepper and a bit olive oil. Yes, I love adding olive oil to my dishes that’s a stateside thing I picked up doing since leaving the islands. I start with a boiling pot of water, where I add the olive oil, salt and pepper. Then place the spinach and diced garlic until cooked down. Onto the popcorn brown rice with black eye peas and black beans. 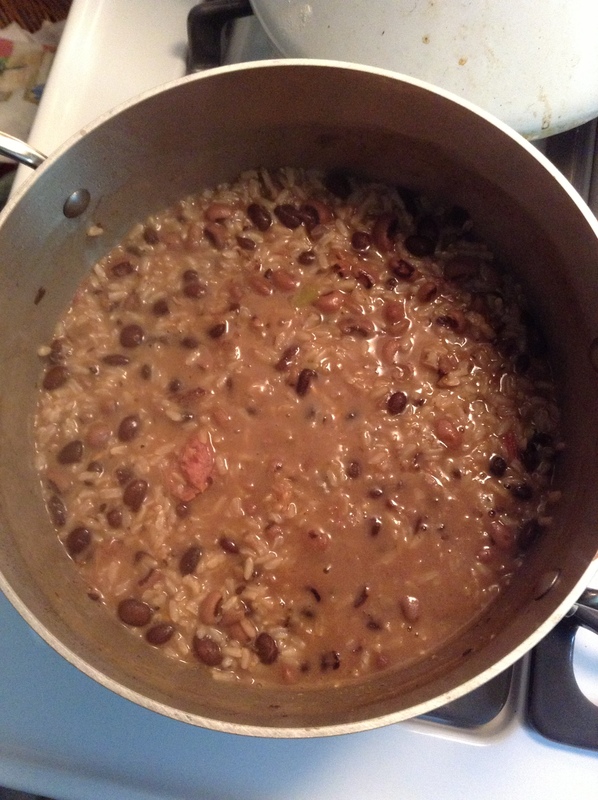 This is actually a two step dish since I needed to cook the black eye peas and black beans with a piece of ham bone then add to the cooking brown rice. Now, you should know if you’re using fresh black eye peas and black beans, you will have to soak them overnight. Then you cook them in a pot with salt, pepper, heavily diced onion and pats of butter and a ham bone. After this combination is cooked you start a pot for the popcorn brown rice, placing olive oil and salt in a boiling pot. Add the popcorn rice, cook, when the grains have begun to soften add the black eye peas and black beans mixture with some of the water it was cooked in. Stir and cover. Check the pot so the rice doesn’t burn or cook out the water without cooking the rice to the consistency desired. My parents, especially my daddy, hated shatter grain rice. This is what he called rice that is cooked but is still too hard. Here’s to more sleepless nights as construction work continue near me and my little kitchen gets a workout. I’ll let you know what I come up with next. Everyone has a ritual, something they do that provides an oasis when things are chaotic. Cooking is my oasis! Just like Superman I have my own Fortress of Solitude, it’s the kitchen that is my oasis. A place where cooking puts me in a calm reflective state and I’m able to do my best work. My home becomes the center of smells that bring strangers to my door in hopes of tasting what has tantalized their noses. Looking back into my childhood I believe cooking became my safety zone because it’s one of the times I was able to share my feelings with my parents. After getting home from school I would take off my uniform pleated skirt (those things are hard to iron) and sit on the kitchen floor by the door in my shorts and white shirt and tell my mom all about my day. Or the weekends when my daddy was making bread and he would talk about his childhood. Those times were filled with something I can’t verbalize but it’s an emotion that wraps around me every time I cook. That feeling of love and safety I believe comes through fingers and is sprinkled into my food. Perhaps, that is why sometimes when I provide the recipe to a dish my friends say, “you didn’t give me everything, you missed something.” I haven’t but my food taste like Olga. Who I am comes through in the food but that’s not to say when you make something it doesn’t taste right. It’s simply the dish now has your stamp on it and that’s ok.
Good food doesn’t have to taste just one way. Otherwise, we wouldn’t have so many restaurants, chefs or recipes. My Caribbean cooking allows me to capture or re-capture an image, a feeling on a plate and share it with others.